A good plan will more likely result in a successful tomato sauce garden. Your garden can be a space of ground in your yard, a raised bed with or without walls, a greenhouse bed or container, a patio container or even a hanging basket. Some gardeners mix their tomato plants right in the flower bed, while others plant them in rows like on a farm. Sun Exposure. Tomato plants need plenty of full sun exposure and warmth from morning until late afternoon throughout the season. Go for the spot that delivers the most sun for the longest number of hours. Crop Rotation. Most experts say to plan on moving your tomato garden every three years or so to foil the insects and diseases that specifically target tomatoes. That way they cannot establish themselves enough to create much damage. Unfortunately not all of us have enough sunny spaces to be able to do that, but if you can plan it that way--that would be best. The beds in my large tomato house (pictured above) is fixed as is. I have grown tomatoes in it now for 4 years and it seems to be doing just fine. We renew the soil annually and hope for the best. In another area, we are able to move an overhead structure to a new set of beds every couple years. Protection from burrowing creatures. We have overzealous moles, shrews and shrew-moles that enjoy tunneling so much in our garden beds that the plant roots end up dangling in air with very little soil contact. The carniverous moles are only interested in eating worms and grubs, however voles will use the tunnels to gain access to a meal of your plant's roots. To prevent this problem from the beginning, dig out about 6-8 inches of the soil and line the sides and bottom of the bed with 1/4-inch hardware cloth, then re-fill the bed with soil which will hide the wire. We continually set out mouse traps to catch them from above. Protection from bigger pests. Pets, wild rabbits, and roaming deer are some of our larger tomato garden pests. You may need to consider perimeter fencing if you have similar issues. Soil quality. Whenever I hear someone having trouble growing tomatoes, they always blame it on the soil. I have failed in this area enough times to realize how important it is to have healthy soil. Large simple house structure with plastic "curtains" on the sides that can be rolled up or down. This structure can also be moved to cover different beds for crop rotation. My raised beds are built with walls to contain the soil. The walls keep the garden neat, and the soil raised above surrouding soil. This makes the beds heat up faster in spring and stay warmer than the surrounding soil throughout the season. Tomatoes love warm soil. For tips on how we built our raised beds along with more tomato garden design ideas, click here. Hoops and plastic over a cinder block bed. 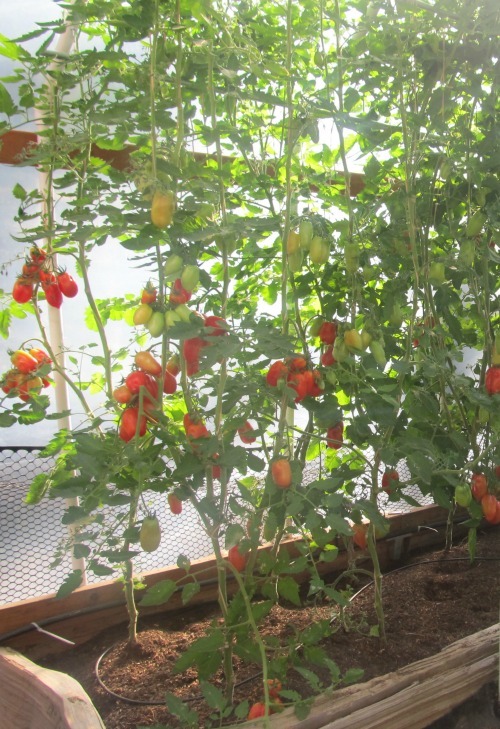 You can grow tomatoes inside or outside, but we've found that covered plants are more reliable to produce ripe tomatoes as long as precautions are taken to insure pollination. 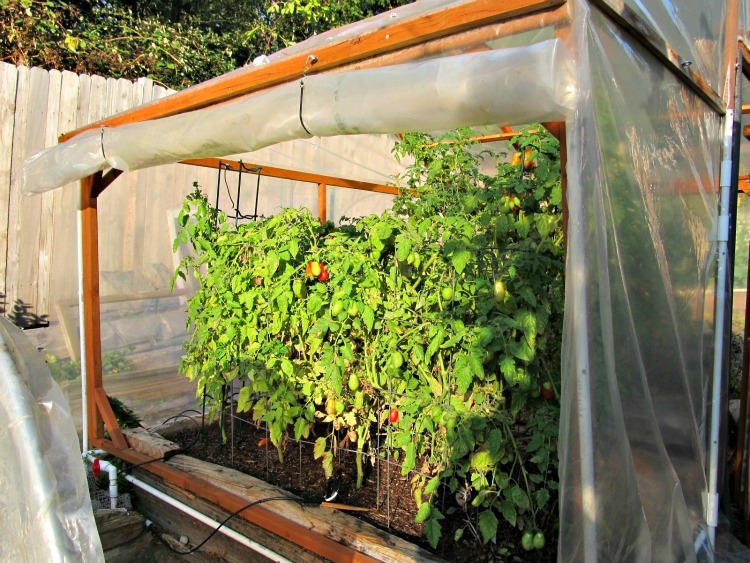 For example, in the photo above, raised beds are outfitted with metal conduit pipe supports with the pipe curving at the top in a hoop shape. The plastic sheeting is clipped to the pipe. PVC clip purchased at a garden center. Black office clips are another useful option. The plastic keeps the heat in and the rain out. 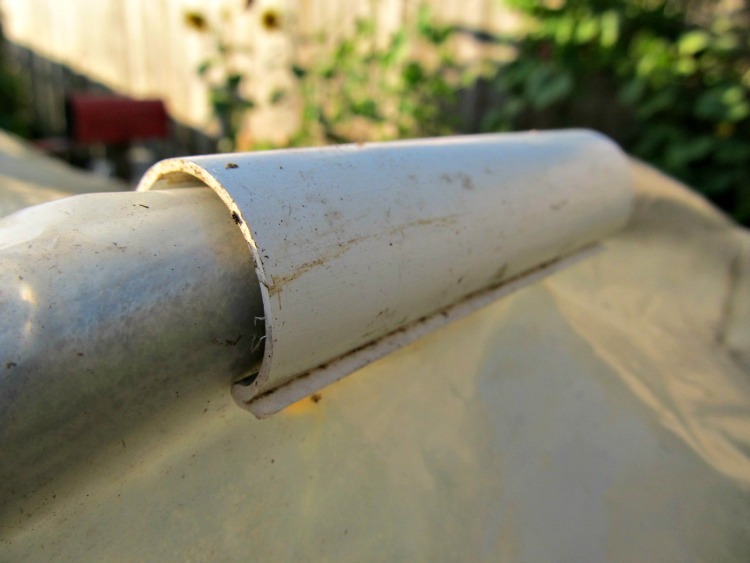 It's like growing tomatoes in a greenhouse with an important difference: the plastic can be rolled up part way to let breezes flow through and vibrate the plants to release pollen. The plastic remaining at the top can act as an umbrella keeping rain off the plants. 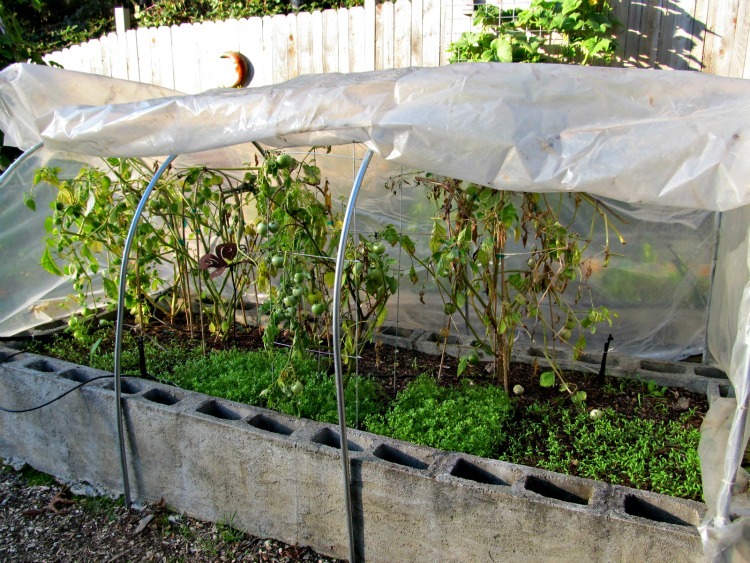 On cooler evenings, we can roll the plastic back down to keep the plants warm. Adding this feature to our garden has doubled our tomato sauce harvest. Growing sauce tomatoes in containers is a great option for limited sunny spaces and it gives you more control over the soil and planting site. Here are some tips for successfully growing your tomato sauce in containers. With your tomato garden planned, built and set up with good, healthy soil, you are ready to move on to the next step in your tomato sauce journey! Go to Planting for tips on planting your sauce tomatoes in the garden. Return from Tomato Garden to Grow Tomato Sauce homepage.